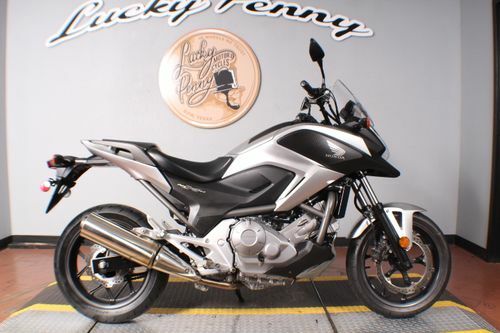 At the heart of the 2012 Honda NC700X lies Honda’s new 670cc parallel-twin engine which rewards with enough power and torque to fill your brain with a tasty mix of dopamine and adrenaline. The liquid-cooled, parallel-twin engine features a single overhead cam, four valves per cylinder and a counterbalancer along with a PGM-FI fuel-injection system and Honda’s second-generation DCT transmission - a technological mix that guarantees advanced performances. In terms of power, the engine is rated at 51 hp at a modest 6250 rpm and 45.7 ft-lb. at a low 4750 rpm. On top of that, the bike carries a slew of new features, including a watertight, locking compartment, a 41mm fork that provides 6" of travel, a Pro-Link shock that delivers 5.9" at the rear wheel, and a single 320mm brake disc squeezed by a two-piston caliper - three pistons on the C-ABS model - up front and a 240mm disc/single-piston-caliper combo out back. This great looking bike is for sale now at Lucky Penny Cycles in Bedford, TX! Come in and take a test ride with us today! Call us at 817-283-1650. IN WHEELS WE TRUST!